Mainstream lipstick is like a sausage – after you find out how it is made, you might never eat it again. After I had learned what goes into making a typical lipstick, I stopped wearing it for a few years. But I am a human, too, and vanity is not a strange feeling to me. In the past 6 months or so, I searched for a natural lipstick that I could wear on special occasions, and today I want to share my finding of the best natural lipstick and help you choose the right color. What is so bad about lipstick? First of all, because we ingest small amounts, I wanted as many ingredients as possible to be food-grade. Unfortunately, because lipstick is a cosmetic product, lipsticks do not have to be food grade, and it would probably be impossible to find a lipstick with 100% food-grade ingredients. Second, every cosmetic product, including lipstick, has to contain colorants. There are two types of colorants: petroleum-based and mineral. Both might have traces of heavy metals; but from specifications detailed by the FDA in 21 CFR 74, generally, petroleum-based colorants have higher limits for lead, arsenic, and mercury. For example, the lead limit is doubled for many petroleum-based dyes (20 ppm versus 10 ppm for mineral pigments). In addition, petroleum-based colorants may have other contaminants specific to petroleum, including benzo[a]pyrene, PAHs (polycyclic aromatic hydrocarbons), and brominated resorcinol. Some of these contaminants are human carcinogens. Thus, as always, and especially in this case, I recommend staying away from petroleum-based products. Unfortunately, while mineral makeup is a better choice, it still may contain traces of heavy metals. To read about independent tests on random samples of cosmetics, head over here. How do heavy metals end up in colorants? They are not added intentionally. Because colorants are derived either from petroleum or from minerals, the raw materials of both come from the Earth’s crust. Heavy metals are a natural part of the Earth’s crust, and are present in water, soil, and air as a result of industrial pollution. Thus, heavy metals are found in colorants used by the makeup industry. When a cosmetics company buys colorants, they should get Certificates of Analysis with them, in which there should be information about heavy metal levels. Most companies are not willing to share these certificates with consumers. I recommend products of companies that shared this information with me. Some companies went as far as claiming that they test colorants for heavy metals instead of relying on the certificates. However, companies who made those claims, such as this one, were not willing to share the results of their tests with me. The reason I am so concerned with heavy metals, especially lead and mercury, is that unlike other substances, they are bio-accumulative, which means that bit by bit they add up in your body and it is not easy to get rid of them. You can read about my detox story here. Ingredients: Ricinus Communis (Castor Seed Oil), Macadamia Ternifolia (Macadamia Seed Oil), Euphorbia Cerifera (Candelilla Wax), Butyrospermum Parkii (Shea Butter Fruit), Camelina Sativa (Camelina Seed Oil), Organic Simmondsia Chinensis (Jojoba Seed Oil), Oryza Sativa (Rice Bran Oil), Prunus Amygdalus Dulcis (Sweet Almond Oil), Limnanthes Alba (Meadowfoam Seed Oil), Rubus Idaeus (Red Raspberry Seed Oil), Copernicia Cerifera (Carnauba Wax), Hydrogenated Simmondsia Chinensis (Jojoba Seed Wax), Titanium Dioxide, Iron Oxides, Micas. Let’s re-group the ingredients for better understanding. Euphorbia Cerifera (Candelilla Wax): extracted from Euphorbia cerifera, a shrub native to Mexico. Candelilla wax (E 902) is authorized in the EU as a food additive as a glazing agent (source), so this ingredient does not raise red flags. Hydrogenated Simmondsia Chinensis (Jojoba Seed Wax): the product of hydrogenation (a chemical process in which hydrogen is added to liquid oils to turn them into a solid form) of jojoba oil obtained from the seed of the jojoba plant. Generally, hydrogenated oils are not used in foods but are not recommended for consumption in big amounts by health experts. As for jojoba oil, see below. Ricinus Communis (Castor Seed Oil): is not used for cooking but is approved by the FDA as a food additive (source). Macadamia Ternifolia (Macadamia Seed Oil): an edible oil, no concerns, would be better if it were certified organic, of course. Camelina Sativa (Camelina Seed Oil): an edible oil with no concerns, it would be better if it were certified organic. Organic Simmondsia Chinensis (Jojoba Seed Oil): a great emollient and used in natural lipsticks as a better alternative to petrolatum; it is not recommended for oral consumption as it contains toxic erucic acid. I believe that in this case, the “dose makes the poison” principle applies, meaning that in some instances, small doses are fine. You might want to wipe your lipstick off before you eat. Note that it stays well on the lips so the amount that transfers is small. Oryza Sativa (Rice Bran Oil): this is a food-grade oil commonly used in cooking. I don’t recommend it for cooking because of the potential for arsenic contamination, but in this case, the amount is too small to be a concern as you will probably ingest more arsenic by eating a spoon of rice. Prunus Amygdalus Dulcis (Sweet Almond Oil): from my research, apparently sweet almond oil can be food-grade; you have to check the label. Limnanthes Alba (Meadowfoam Seed Oil): not edible; however, I did not find any information about any adverse effects if it is orally consumed in small quantities. Rubus Idaeus (Red Raspberry Seed Oil): is not an edible oil but again I did not find any information about any adverse effects if it is orally consumed in small quantities. Butyrospermum Parkii (Shea Butter Fruit): a vegetable fat obtained from the fruit of a tree native to Africa, Butyrospermum parkii. There are three types of mineral pigments used in the Au Naturale Cosmetics Eternity lipstick, which are commonly used in natural cosmetics. Au Naturale Cosmetics showed me their Certificates of Analysis, which showed heavy metal levels within the limits set forth by the FDA and European standards for colorants, including 0 levels for some heavy metals such as lead, mercury, and arsenic. Titanium Dioxide: is widely used in sunscreen as a UV absorber and in cosmetics as a colorant; rated 1-3 in the Skin Deep database as there are health concerns when it is inhaled. Iron Oxides: a mineral pigment widely used in natural cosmetics as a safer alternative to synthetic petroleum-based dyes; rated 2 in the Skin Deep database as it is listed in Canada Environment Substance List as persistent (does not biodegrade easily) and may be toxic when inhaled. Micas: a mineral pigment widely used in natural cosmetics as a safer alternative to synthetic petroleum-based dyes; rated 2 in the Skin Deep database as it is listed in Canada Environment Substance List as persistent (takes a long time to break down). If possible, Au Naturale tries to source colorants that are EcoCert certified and NOT made in China. I have to tell you, it is not easy to find a company that uses EcoCert colorants and discloses a manufacturing country of origin of their colorants. The only company I have found that sources only EcoCert pigments that are NOT made in China is Crunchi. This concludes my ingredient review of the Au Naturale Cosmetics Eternity lipstick. After looking at every ingredient of this natural lipstick and a number of others, I believe its safety is the best. There were other cosmetic companies that I thought might be promising; however, they did not reply to me with answers to my questions. That’s another thing before I recommend a product, I like to speak with the person who formulates the products, which makes a big difference in gauging the company’s trustworthiness. How did I like Au Naturale Cosmetics Eternity lipstick? There are some reviews on Amazon that point out that the lipstick is dry. I have not found that to be a problem, maybe because I do not have an expectation that a lipstick will act as a moisturizer. My lips get dry often, especially in the morning. I use a lip balm before going to bed or during the day if needed. I actually liked the fact that it is on the drier side, which makes it less transferable to food or drinking glasses/cups. As for shades, true, it is not L’Oreal, so it does not have hundreds of shades. However, I believe it has a sufficient number of shades to choose from. 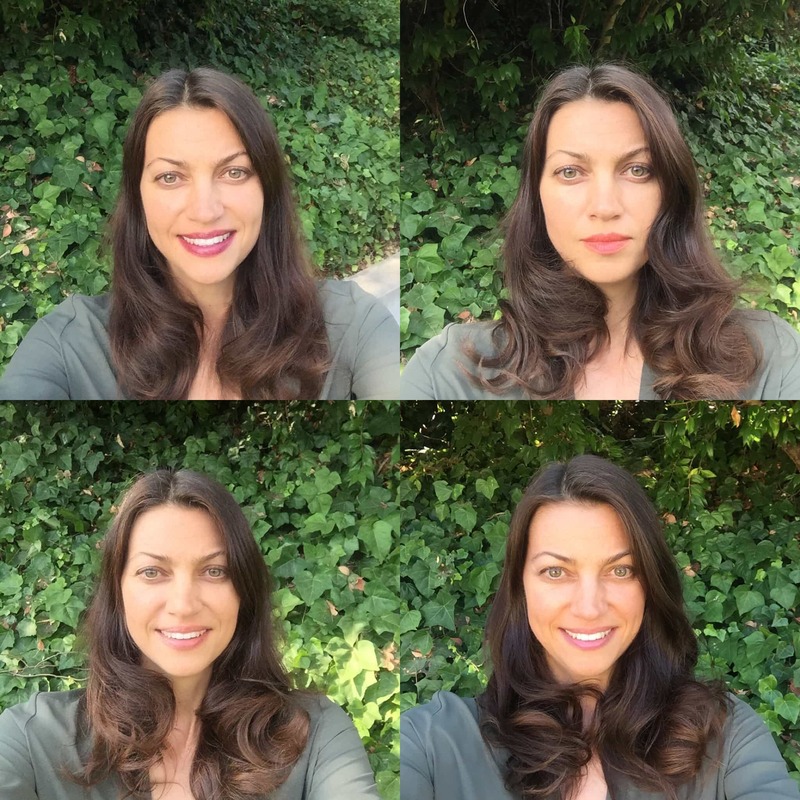 Here are my pictures wearing 4 different shades. From top left to bottom right, they are Elsa Luisa, Cha-Cha, Primrose, and Innocence. I like them all depending on the occasion and what I wear. I contacted their makeup artist and based on my picture and preferences, she chose the Innocence shade for me, which you can see in the right bottom corner. You might want to contact her for a shade consultation as well. 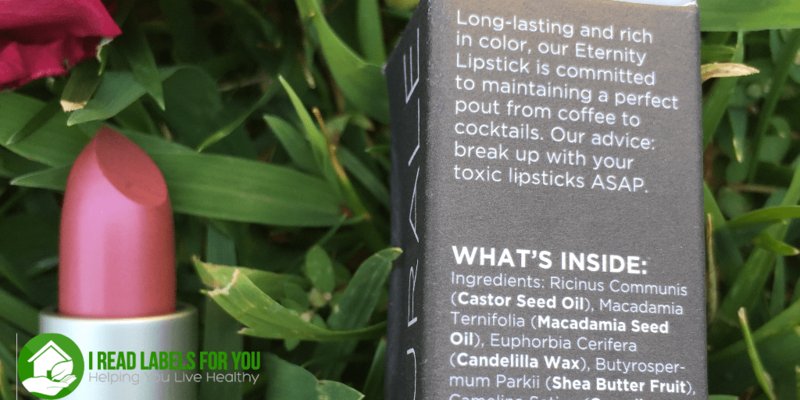 Since I reviewed this natural lipstick, I have found another non-toxic lipstick that I like even better. What do you think about the brand Lili Lolo? I would also like to know more about Lily Lolo makeup products. I have already purchased their mascara, but haven’t started using it just yet. I would also like to try out their mineral foundation, but would like to know your opinion of the brand and ingredients they use first. I would love to hear your thoughts about this product’s ingredients at least. I know Sodium Hydroxide is bad, but it’s really hard to find a product that doesn’t have at least one questionable or potentially harmful ingredient. I decided to buy it because it had good reviews and reasonable price. I will try it out when I use up the one I am currently using. Hi Irina! Have you tried the lipsticks of Hynt beauty and NU Evolution cosmetics? Thank you! Hi Irina! Have you heard of Red Apple Lipstick? I’m curious about what you think of them. I’ve been using their lipstick for the last two years or so. They look great on you! I never wear lipstick but have an event next week and thinking of buying one and will do so from your link. I have similar hair color and complexion as you. Between the primrose and innocence color which do you think is less bold. It’s hard to tell in the picture. I want one that doesn’t feel like I’m wearing much of a color but just a little something. Thanks for all your research!! Hi Irina, thank you for answering. Are the other products from Au Naturale, like the lip gloss, and other products also safe, in your consideration? Irina: I love the cha-cha color on you best 🙂 You look beautiful. Hi Irina! Have you tried the Crunchi cosmetics? What are your thoughts ? Thank you Irina! Can you please let me know if they come back to you? Thank you! Thank you for this review! Ordered a tube and love the primrose color! So natural looking and great coverage! What lip balm do you use? You had mentioned in the article that your lips get dry and you apply a lip balm before bed.